THANKS FOR CHECKING IN, BELOVED READERS!!! As we write these words in the office of Machaneh Yavneh, the excitement that pervades the camp before Zimriyah is tangible in the very air. 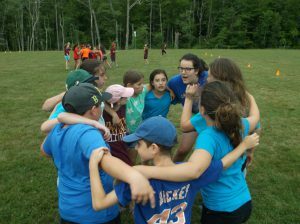 Chanichim (campers) and madrichim (counselors) alike proudly wear Zim shirts from past summers and sing their favorite Zim songs from across the aydot (units). The chadar ochel (dining hall) is filled with the sounds of recordings of past winners and hushed predictions for the outcomes of the evening can be heard by the salad bar. Zimriyah is a camp-wide evening of singing during which, each aydah prepares and performs three songs in three different categories. Although it is a competition, in aydat Gurim we prefer to have as much fun as possible and worry less about the minutia of arrangements and harmonies. NEEDLESS TO SAY, WE STILL SOUND GREAT AND CAN’T WAIT TO SHOW THE CAMP TONIGHT!! The rest of our week has been jam-packed with fun stuff as first session winds down. We finished our chesed (acts of loving kindness) project just in time; we made challah covers for the camp to use on Shabbat instead of flimsy napkins. We are very excited to see them all set up on the shulchanot (tables) tomorrow night. On Tuesday we watched Aladdin, the Kerem play, and the songs have been stuck in our heads ever since! 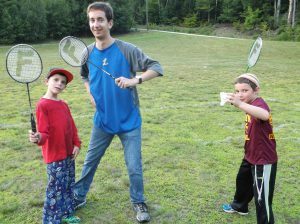 On Tuesday night, while the rest of the camp was watching the play, the banim (boys) played lawn games, such as cricket and badminton, and the banot (girls) had a pajama dance party to finish off Pajama Day (they got to wear their pajamas all day). At the end of the night, each of them had created a new pajama shirt and had one another sign the shirts as a sweet memory from their summer. Wednesday was a day filled with rehearsals with the band for Zimriyah, mixed in with a little free swim. We also went to see the movie Minions in theaters with our Ma’alot buddies. IT WAS HILARIOUS and we couldn’t stop laughing the entire time. To end a great day, we had a barbecue with steak and hot dogs for dinner, and afterwards played a huge game of capture the flag with no less than four teams. At the end of the game, we all got glow sticks and had a huge dance party with special lights. It was the perfect way to end a great day. Can’t wait to see you all soon!